As you may or may not have been aware, a month or two ago, a new Cornish online newspaper entitled The Cornish Gazette blasted into existence. It is essentially a satirical paper, (along the lines of a Cornish Private Eye) however some articles also cover important news and issues the ‘local’ press are perhaps, less inclined to print. Satire within Cornwall has long been needed. Politics and politicians on the grand stage encounter it always – in Cornwall, someone writes a letter to the West Briton and that’s the end of that. Now our elected members of parliament in the Duchy, along with their counterparts in Lys Kernow are being scrutinised and parodied for their behaviour, as well as policy. It doesn’t stop with politicians though. Anyone or any company is fair game it seems! So within, you have the floppy-haired Andy Gorge MP as well as positive news bringer Arabella Kingston (aping the typical Tory sloane journo-type), the Week in Gibberish (tackling nonsense), a rabid old fart and any number of comedic videos. The latest edition is out on November 30th . This was intended as a heads up more than a review but it’s starting to sound like one, so I’ll just leave you with the link! So British International Helicopters (BIH), pulls out of Penzance, where it flies back and forth to the islands as it has done since 1964. Now it sells the land to supermarket giant Sainsbury’s. Apparently the only way the company can continue is if this sale takes place. Putting to one side (for the moment) the fact that Penzance does not need another supermarket, being served by no less than Co-op, Tesco and Morrisons (sometimes in multiples! ), Penzance is the ideal town from which to fly a helicopter service to the islands (presumably why they put it there in the first place!). Next, it decides it wants to relocate several miles up the A30 to the small village of St Erth. The people of said village rightly say, ‘bugger that!’ and a few days after general feeling is made known through a public meeting, BIH pull their planning application and suddenly there’s talk of re-locating to Newquay airport, (where BIH already have their Navy support and aircraft maintenance services). Call me cynical but all this smacks of smoke-screen. BIH have withdrawn too easily! They (BIH) would hope, that the furore over in St Erth would detract from the sale of land for an erection of a Sainsbury’s and in some ways it has. Protesting, in the form of multiple banners and signage has occured along the A30 in the proposed new heliport area, while in Penzance, supermarket planning has gone through, almost as a fait accompli, with some councillors and civic leaders zipping up their collective fly and claiming no harm will come to the independent trader of Penzance. The town is about to get the equivalent of foreign aid turning up with salt water and pirates! From an aesthetic point of view, is another supermarket a good replacement for a vital transport link on the approach to Penzance? You’re driving west, down the A30 towards Penzance. What are you greeted with? First off, the stench from McDonalds and KFC; then the unbelievably expensive road signs that wouldn’t look out of place on the M25, coupled with a round-about that defies all road-sense and the Highway Code. Next there’s, Morrisons, Halfords and B&Q and then… Sainsbury’s! But there will be a park and ride to save you the two minute drive into one of Penzance’s ridiculously priced car-parks! So, the islanders who need to nip back to the mainland will no longer have the closest (and quickest) port of call. A town which is synonomous with the Islands and easy for visitors to access, will no longer have its aerial link. What it will have, is a new shopping ‘experience’ and somewhere for visitors to park their car to get bussed down the road. Having the heli-link in Newquay is like having the ferry link in Falmouth. Ridiculous! The latter of course, was another outright lie put forth by the ‘great and good’, the former however, looks to be a reality. The residents of St Erth were right to object – Penzance is where the helicopter should fly from, it’s just a shame that the wheels, or in this case, the blades, of big business are put above the needs of ordinary people. 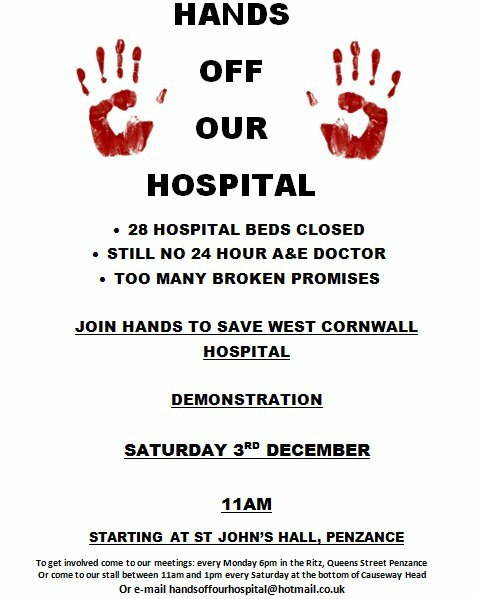 On Saturday December 3rd, a demonstration will be held against cuts to some of the services of West Cornwall Hospital in Penzance. Hands Off Our Hospital – a new campaign established to fight against cuts towards WCH, has issued a demand to have services such as a recently closed ward with 28 beds, re-opened and for the installment of a permanent 24 hour doctor in the Accident and Emergency department. Long, has been the battle for WCH, with marches taking place over the years, while ‘Royal’ Cornwall Hospitals Trust (RCHT) do everything they can to diminish care in Penwith whilst sticking two fingers up at the tax-paying populace. Most people would agree that it is an affront that the people of West Penwith have to travel a round-trip of up to 75 miles to Treliske for services that should be closer to home. This is a greater distance than a round-trip from Liverpool to Manchester! Would the people of these cities tolerate this? Having no 24-hour doctor-led acute care also puts lives at risk. As father says, “Who’s takin’ the piss outta who?”. Join in the demonstration/march at 11am on Saturday December 3rd, outside St John’s Hall, Penzance. Further to the post, Natural ‘England’ – rapists of historic Cornish moorland. A Penzance archaeologist and historian has joined with Cornish MP George Eustice in calling for ‘English’ Heritage to be replaced, in Cornwall, with a locally based body. Craig Weatherhill, author of several books, papers and articles, is exasperated by what he terms: “This arrogant quango’s disgraceful neglect of, and contempt for, Cornwall’s valuable heritage”. The latest in a series of incidents stems from a site meeting on Aug 6th, by groups concerned with serial damage to the Tregeseal stone circle, St Just, and associated ancient monuments, allegedly by activities imposed upon the moorland by sister quango Natural ‘England’. “Initially, ‘English’ Heritage did not want to know,” says Mr Weatherhill, “until the Celtic League, an organisation recognised by the United Nations, became involved. The Assistant Inspector of Ancient Monuments, who attended, promised to produce his recommendations within a fortnight. He failed to do so. Frequent enquiries since then have merely produced adjusted promises, the last being for Oct.19. That has come and gone, and still there is nothing. “It is nowhere near good enough. ‘English’ Heritage has a long record of turning blind eyes to the damage and destruction of ancient sites in Cornwall, from the Cadbury’s Creme Egg Hunt in 1984, to the utter destruction of numerous sites they are appointed to protect. They ruined the fogous at Carn Euny and Chysauster, and publicly insulted those who spoke out. According to their then Chairman, the latter ‘wasn’t exactly Stonehenge’, which pretty well sums up their whole attitude. Referring to the original bid that secured World Heritage Site status for Cornish mining, Mr Weatherhill outlined the actions of ‘English’ Heritage to delist and support the demolition of a Grade II star engine house near St Austell. “EH’s case,” he said, “was that the engine house was worthless as it did not contain an engine. This was astonishingly ignorant, and not only effectively placed all but two Cornish engine houses at serious risk, but almost jeopardised the entire WHS bid. Of course, it need hardly be said that the applicant was a major corporation”. “At Tintagel in 1998,” he added, “news of the discovery of a piece of slate incised with names of 6th century men, including one called Artognou, was suppressed by EH until the start of the peak holiday season. Then they arranged headlines in every major newspaper, claiming proof of King Arthur. Of course, this was total bilge, but EH was far more interested in the gate money than they were giving historical facts. Our heritage deserves much, much better than this. “In 1988, Penwith Council wrote to EH, concerned that significant monuments in the area had no legal protection. EH assured them that a radical new Scheduling list was in progress, to be complete within 5 years. It never appeared, not to this very day, but EH kept on giving the Council that assurance.” Mr Weatherhill says. “Then, just last year, I came across a document written by Cornwall’s Historic Environment Service in 2008, clearly stating that all Scheduling in West Penwith had been halted in 1987, EH deciding that the new Environmentally Sensitive Area scheme for Penwith would be adequate protection. Of course, it was no such thing. The ESA had no statutory teeth, and only a voluntary take-up. If that wasn’t bad enough, EH had deliberately lied, several times, to the local authority! I know this to be fact, because I was the officer at the Council who wrote the letters. 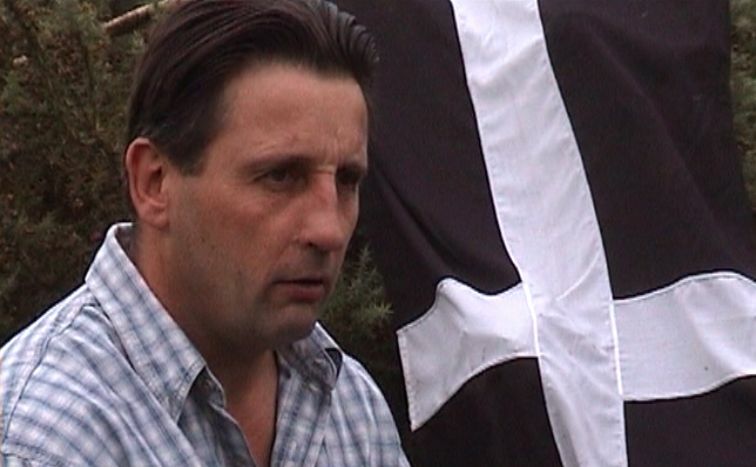 Mr Weatherhill, who became a Bard of the Cornish Gorsedd in 1981 for services to archaeology, claimed he could cite many more cases of ‘English’ Heritage’s neglect and misrepresentation, least of all that which marketed Cornish Celtic heritage as that of a totally unconnected people. “There is a frankly sinister political aspect to EH’s policies”, he claimed. His call for the disbanding of ‘English’ Heritage and Natural ‘England’ is also economically sensible, he suggests. “If the government is serious about curtailing expenditure,” he says, “then what is the sense in maintaining two tiers of administration in both fields? Get rid of the national bodies, and devolve their powers to local level and local knowledge. We still await signs of Mr Cameron’s much-vaunted ‘localism’, especially on this side of the Amazon*, so here’s a perfect way to kickstart it.” He added that most Cornish people he had spoken to would be greatly relieved to see the backs of both quangoes.